Often there is confusion about what a large ensemble is and what a big band is. 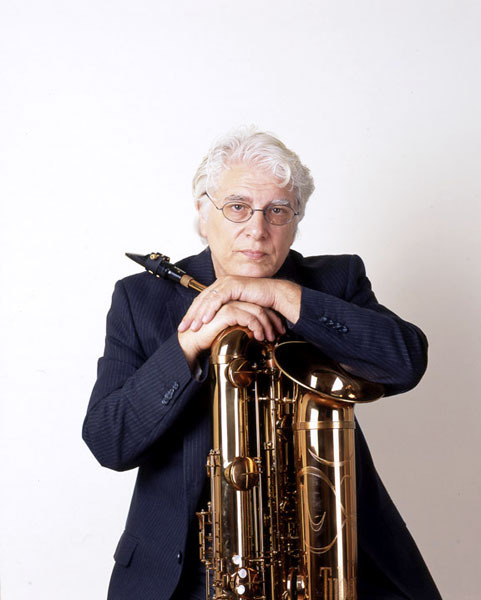 I do not consider any of my larger ensembles to be a big band, which is why I distinguish the difference between Big Band music and my Chamber Orchestras by using the name Vinny Golia Large Ensemble or Vinny Golia New Music Orchestra. The Large Ensemble music I am writing is tailored for specific individuals who are adept in many areas of sound. These areas include music of other cultures, Jazz, popular music forms like funk, and contemporary classical forms. Many people have asked why I include space for improvisation within my notated compositions. Using Improvisation gives the musicians a chance to personally develop the compositions within a personal space. I provide a guided structure, via notation, signs and signals, all of which can be tailored for any specific player in the ensemble, as all the members can improvise well, very well. There are transition areas where the player or players can adapt to or set up the next composition’s emotive state or sonic palette, and these may include notation or be a free area. The use of improvisation in this manner gives the performer added input into the overall concept of what the concert will achieve in terms of feeling, emotion, energy and expression, which might be one-sided if left only to the composer’s notated music. The performer(s) improvisations usually take a close approach to the compositional concepts included in what I write as composer, guided by my use of notation, or sometimes using two conductors and large orchestrated areas. The soloist(s) can reference notated compositional areas and/or add individual input to the overall piece. He/She, depending on the structure upon which the improvisation is based, can interpret, enhance, comment or expound on the notated sections of the music, creating a more personal rather than orchestral experience for the listener, although a blending of both is what I am striving for. I expect my soloists to be well versed in each composition, to be familiar with any harmonic material presented, to be able to use a classical Jazz or a folk-ish approach to their improvisations if necessary, and to have an awareness of the rhythm, shape, form and color of the composition as a whole, not in just one extracted part where they are featured. Each of their solo areas in the composition(s) create a commentary to the entire evenings’ concert, which forms a whole when all the areas of the entire concert are completed. An aural jigsaw puzzle if you will. During the performance I may use Cards which indicate which sections can be played behind the soloist, and I may use hand signals to shape the orchestra sections to accompany the soloist(s). I also have a chalkboard on which I can write spontaneous rhythmic figures and/or instruction to the section players as well as various hand signals which I have developed over the years. The Large Ensemble soloists are an added tool in the palette of an orchestral approach; these soloists are hand-picked because of their strengths. (Here I should say every one of the 50 or so performers I use can solo quite dramatically with great power and/or finesse.) I use them in the compositions as chess pieces to achieve the sonic areas I need. But if the soloist moves in a different direction than I anticipated, I have the tools to change the backgrounds and structures, so in this way the soloists have the freedom to express themselves, and I have the flexibility to alter the direction of both orchestra and soloist to go where I need them to go for the upcoming compositional selection. In this way I do not need to control the soloists as much as listen to them.